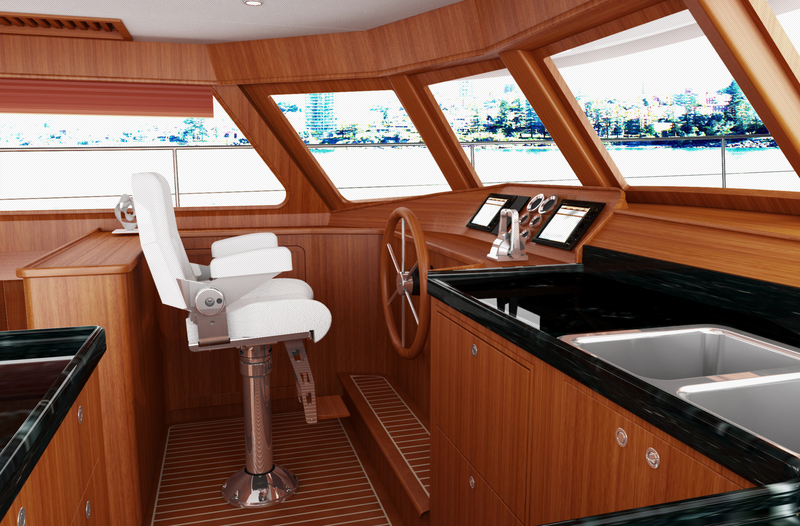 It’s always a great thing when you get a call from Andrew or Leilani over at Ocean Trawler Yachts informing you that they have a new design you should check out. 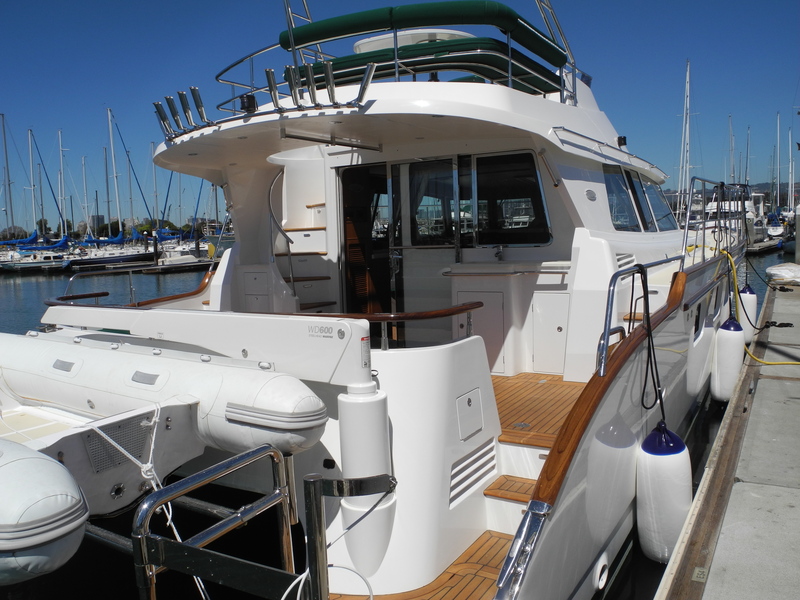 They’re great folks and have an amazing amount of knowledge about their chosen field of expertise which just happens to be offshore trawlers or coastal cruising power yachts. 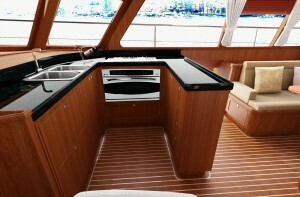 So I admit I was a bit taken aback when they introduced me to the Journey Cat 47 Long Range Cruiser. That is, until I got the entire background story which is a totally intriguing tale in and of itself. The Journey Cat 47 LRC came about as the result of a non-stop, 2,800 mile trip from Long Beach, California to the Panama Canal made on the 50-foot offshore filming platform named Water Wizards. Water Wizards made the trip in just less than six days for an average speed of right around 20 knots. Which, if you’ve ever done that delivery, is pretty phenomenal because of the variety of conditions you can encounter. 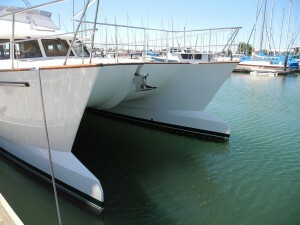 Water Wizards was able to do this because of its unique twin wave-piercing hull design which allows the catamaran to go through the waves rather than going up and over which as a result reduces pitching. When the vessel doesn’t pitch, this allows the vessel to maintain a higher running speed as well as providing the crew a very comfortable ride in almost any condition. 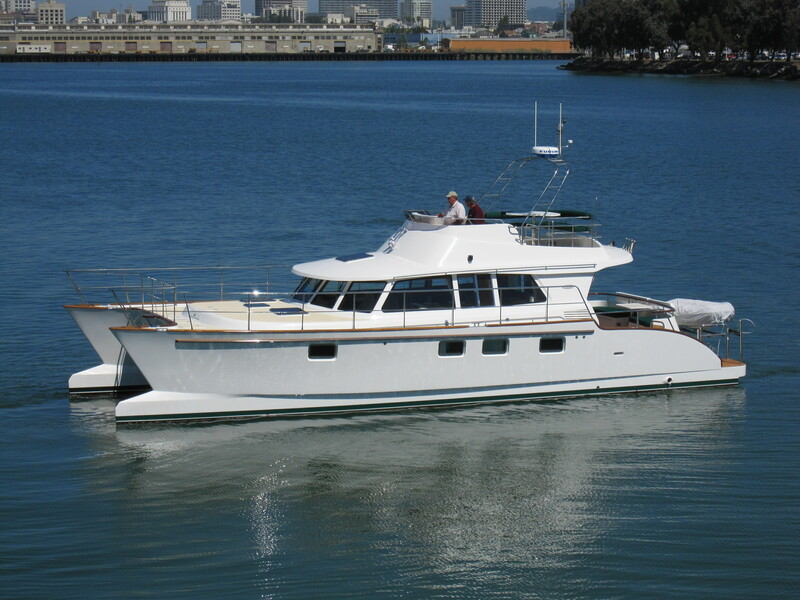 Sounds like a pretty good cruising platform to us as it did to three folks from Bay Island Yachts in Alameda, California who decided to use this Tim Kernan design as the basis for the Journey Cat 47 LRC. And yes, this is the same Tim Kernan who got his start working in the office of the Pacific Northwest’s own Robert Perry while Robert was designing the very quick and very famous ICON. 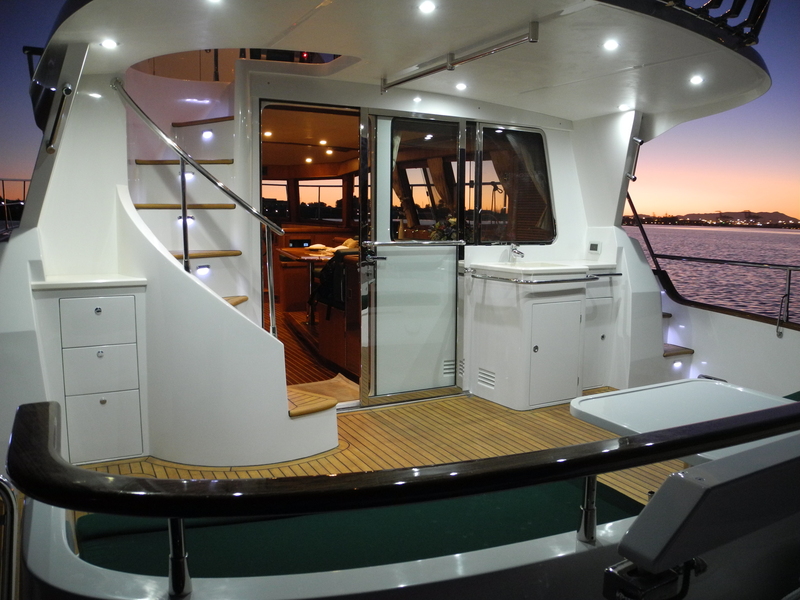 There isn’t enough room here to go into all the details of the building of this remarkable vessel, however suffice it to say that since the Journey Cat 47 is built at the same yard as the Selene Trawlers it has the same legendary offshore integrity as well as the same gorgeous fit and finish. 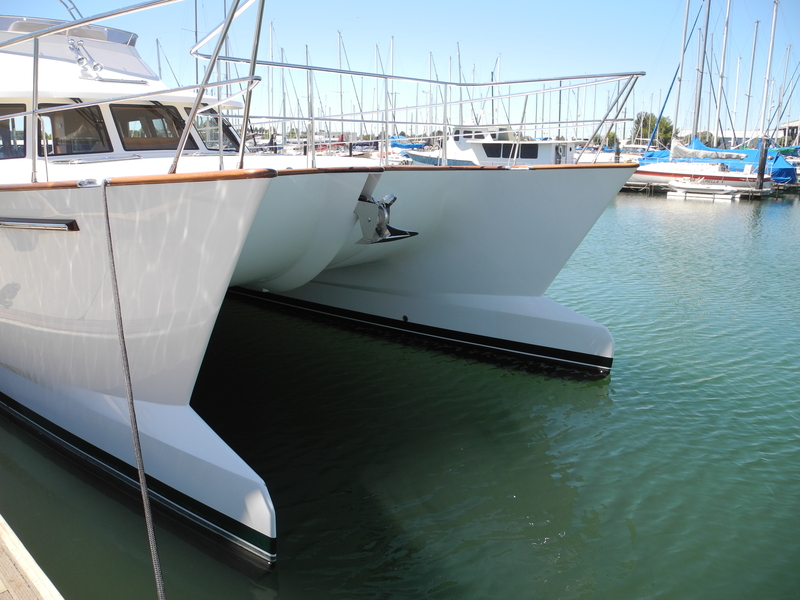 The 47 with its unique wave piercing hull profile is absolutely unmistakable when you either see it on the water or walk by it at the dock. The very first feature that grabs you is just how easy it is to get aboard whether the vessel is stern tied or side tied; very clever. Once aboard you walk up to the aft deck and walk forward into the very spacious grand salon, with a large settee to starboard and individual seating to port. You will be impressed with just how much interior volume this catamaran design provides. Positioned ahead and to port is the lower helm station which provides the helmsperson with excellent sitelines [sic] fore and aft. 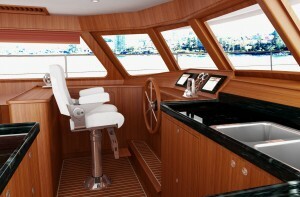 Very conveniently located to starboard is the large and efficiently laid out galley. With all of this on one level, no one misses out on the spectacular views provided by the large windows which wrap almost all the way around. From the grand salon it’s only four steps down to the master stateroom on the starboard side with the head and utility room located just aft of the steps. 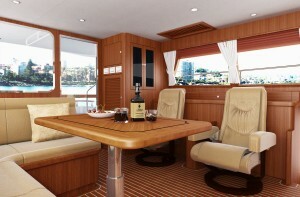 On the port side you have a slightly smaller guest stateroom with an ensuite as well. 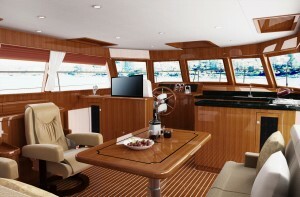 From both sides you have interior access to the engine rooms. 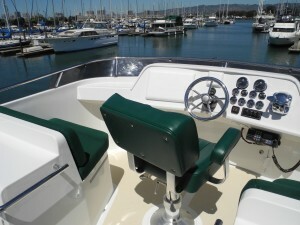 You can also access the engines from the deck as well. Speaking of engines, the Journey Cat 47 has for standard power 6BY Yanmar 260HP six cylinder CR diesels which will drive the this Cat at over 20 knots. If you want to cruise a little more efficiently just throttle back to 12-14 knots and you’ve got enough fuel to go from Seattle to Ketchikan, non-stop, easily. If you want to throttle back just a bit more, say to 9-10 knots, your fuel consumption drops to a very miserly two (2) miles per gallon. As you would expect, the Journey Cat 47 is very well outfitted with top notch standard equipment and yet if you want to do some customization, don’t hesitate to ask. This is a great looking vessel which definitely fits the Northwest Yachting definition of the perfect cruising vessel: She will comfortably and luxuriously sleep four (or more with an optional layout), she will party 20, and yet she is easily handled by two. She has the speed to out run nasty weather systems or make a tide gate yet can handle the heavy weather if need be. Best of all, she is on display and ready for a great summer of cruising. Just call and make your appointment today. 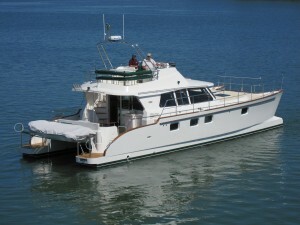 Specifications: LOA-47.42’ (14.45m); LWL-45.92’ (14m); Beam-18’ (5.49m); Draft-3.5’ (1.06m); Displ-37,500 lbs (17,009kgs); Fuel-680 gals (2,574 L). 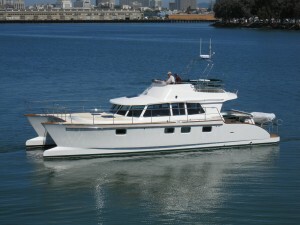 Northwest Dealer: Ocean Trawler Yachts, 1001 Fairview Ave. North, Suite 1300, Seattle, WA; 206-659-0710.